Persepolis (Greek, literally meaning "The city of the Persians"), Parseh (Persian: پارسه, literally meaning "The city of Persians"), also known as Takht-e-Jamshid (Persian: تخت جمشید, literally meaning "the throne of Jamshid"), was the ceremonial capital of the Achaemenid Empire (ca. 550–330 BC). Persepolis is situated 60 km northeast of the city of Shiraz in Fars Province, Iran. The earliest remains of Persepolis date back to 515 BC. It exemplifies the Achaemenid style of architecture. UNESCO declared the ruins of Persepolis a World Heritage Site in 1979. 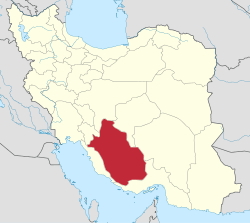 To the ancient Persians, the city was known as Pārseh (𐎱𐎠𐎼𐎿; "The city of The Persians"). 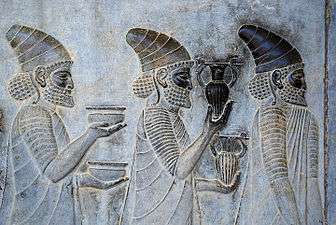 The English word Persepolis is derived from the Greek Persépolis (Περσέπολις), a compound of Pérsēs (Πέρσης) and pólis (πόλις), meaning "the Persian city." Due to the belief among Late Antiquity Persians that the monuments were built by Jamshid, an Iranian mythological figure, the site has been known as the Takht-e-Jamshid (Persian: تخت جمشید‎‎, literally the Throne of Jamshid) since the time of the Sassanid Empire, 224–651 AD. Since, to judge from the inscriptions, the buildings of Persepolis commenced with Darius I, it was probably under this king, with whom the scepter passed to a new branch of the royal house, that Persepolis became the capital of Iran proper. As the residence of the rulers of the empire, however, a remote place in a difficult alpine region was far from convenient. The country's true capitals were Susa, Babylon and Ecbatana. This accounts for the fact that the Greeks were not acquainted with the city until Alexander the Great took and plundered it. Darius I ordered the construction of the Apadana and the Council Hall (Tripylon or the "Triple Gate"), as well as the main imperial Treasury and its surroundings. These were completed during the reign of his son, Xerxes I. Further construction of the buildings on the terrace continued until the downfall of the Achaemenid Empire. Grey limestone was the main building material used in Persepolis. After natural rock had been leveled and the depressions filled in, the terrace was prepared. Major tunnels for sewage were dug underground through the rock. A large elevated water storage tank was carved at the eastern foot of the mountain. Professor Olmstead suggested the cistern was constructed at the same time that construction of the towers began. The uneven plan of the terrace, including the foundation, acted like a castle, whose angled walls enabled its defenders to target any section of the external front. Diodorus writes that Persepolis had three walls with ramparts, which all had towers to provide a protected space for the defense personnel. The first wall was 7 metres (23 feet) tall, the second, 14 metres (46 feet) and the third wall, which covered all four sides, was 27 metres (89 feet) in height, though no presence of the wall exists in modern times. After invading Achaemenid Persia in 330 BC, Alexander the Great sent the main force of his army to Persepolis by the Royal Road. He stormed the "Persian Gates", a pass through the modern Zagros Mountains. There Ariobarzanes of Persis successfully ambushed Alexander the Great's army with his 1000 Persian immortals, inflicting heavy casualties. The Persian success at the Battle of the Persian Gate was short lived though; after being held off for 30 days, Alexander the Great outflanked and destroyed the defenders. Ariobarzanes himself was killed either during the battle or during the retreat to Persepolis. Some sources indicate that the Persian were betrayed by a captured tribal chief who showed the Macedonians an alternate path that allowed them to outflank Ariobarzanes in a reversal of Thermopylae. 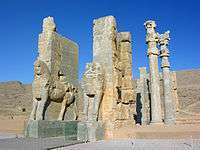 After several months, Alexander allowed his troops to loot Persepolis. Around that time, a fire burned "the palaces" or "the palace". Scholars agree that this event, described in historic sources, occurred at the ruins that have been now re-identified as Persepolis. From Stolze's investigations, it appears that at least one of these, the castle built by Xerxes I, bears evident traces of having been destroyed by fire. The locality described by Diodorus after Cleitarchus corresponds in important particulars with the historic Persepolis, for example, in being supported by the mountain on the east. 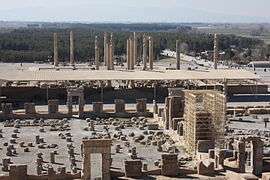 It is believed that the fire which destroyed Persepolis started from Hadish Palace, which was the living quarters of Xerxes I, and spread to the rest of the city. It is not clear if the fire was an accident or a deliberate act of revenge for the burning of the Acropolis of Athens during the second Persian invasion of Greece. Many historians argue that while Alexander's army celebrated with a symposium, they decided to take revenge against the Persians. In that case, it would be a combination of the two. The Book of Arda Wiraz, a Zoroastrian work composed in the 3rd or 4th century, describes Persepolis' archives as containing "all the Avesta and Zend, written upon prepared cow-skins, and with gold ink," that were destroyed. Indeed, in his Chronology of the Ancient Nations, the native Iranian writer Biruni indicates unavailability of certain native Iranian historiographical sources in post-Achaemenid era, especially during the Arsacid Empire (Parthians). He adds, "[Alexander] burned the whole of Persepolis as revenge to the Persians, because it seems the Persian King Xerxes had burnt the Greek City of Athens around 150 years ago. People say that, even at the present time, the traces of fire are visible in some places." Paradoxically, the event that caused the destruction of the these texts may have resulted in the preservation of Achaemenid administrative archives, which might otherwise have been lost over time to natural and man-made events. According to archaeological evidence, the partial burning of Persepolis did not affect what are now referred to as the Persepolis Fortification Archive tablets, but rather may have caused the eventual collapse of the upper part of the northern fortification wall that preserved the tablets until their recovery by the Oriental Institute's archaeologists. In 316 BC, Persepolis was still the capital of Persia as a province of the great Macedonian Empire (see Diod. xix, 21 seq., 46; probably after Hieronymus of Cardia, who was living about 326). The city must have gradually declined in the course of time. The lower city at the foot of imperial city might have survived for a longer time; but the ruins of the Achaemenids remained as a witness to its ancient glory. It is probable that the principal town of the country, or at least of the district, was always in this neighborhood. About 200 BC, the city of Estakhr, five kilometers north of Persepolis, was the seat of the local governors. From there, the foundations of the second great Persian Empire were laid, and there Estakhr acquired special importance as the center of priestly wisdom and orthodoxy. The Sassanid kings have covered the face of the rocks in this neighborhood, and in part even the Achaemenid ruins, with their sculptures and inscriptions. They must themselves have been built largely there, although never on the same scale of magnificence as their ancient predecessors. The Romans knew as little about Estakhr as the Greeks had known about Persepolis, despite the fact that the Sassanids maintained relations for four hundred years, friendly or hostile, with the empire. At the time of the Muslim invasion of Persia, Estakhr offered a desperate resistance. It was still a place of considerable importance in the first century of Islam, although its greatness was speedily eclipsed by the new metropolis of Shiraz. In the 10th century, Estakhr dwindled to insignificance, as seen from the descriptions of Estakhri, a native (c. 950), and of Mukaddasi (c. 985). During the following centuries, Estakhr gradually declined, until it ceased to exist as a city. Pietro della Valle visited Persepolis in 1621, and noticed that only 25 of the 72 original columns were standing either due to vandalism or natural processes. 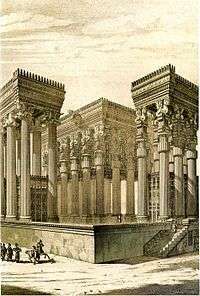 The Dutch traveler Cornelis de Bruijn visited Persepolis in 1704. He was the first westerner who made drawings of Persepolis. The fruitful region was covered with villages till the frightful devastation in the 18th century; and even now it is, comparatively speaking, well cultivated. The Castle of Estakhr played a conspicuous part as a strong fortress, several times, during the Muslim period. It was the middlemost and the highest of the three steep crags which rise from the valley of the Kur, at some distance to the west or northwest of the necropolis of the Rostam Relief. French voyagers Eugène Flandin and Pascal Coste are among the first to provide not only a literary review of the structure of Persepolis, but also to create some of the best and earliest visual depictions of its structure. In their publications in Paris, in 1881 and 1882, titled Voyages en Perse de MM. Eugene Flanin peintre et Pascal Coste architect, the authors provided some 350 ground breaking illustrations of Persepolis. French influence and interest in Persia's archaeological findings would not end until time of Reza Shah, where such distinguished figures as André Godard helped create Iran's first heritage museum. Herzfeld believed the reasons behind the construction of Persepolis were the need for a majestic atmosphere, a symbol for their empire, and to celebrate special events, especially the Nowruz. 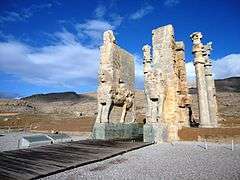 For historical reasons, Persepolis was built where the Achaemenid Dynasty was founded, although it was not the center of the empire at that time. Persepolitan architecture is noted for its use of wooden columns. Architects resorted to stone only when the largest cedars of Lebanon or teak trees of India did not fulfill the required sizes. 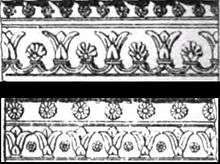 Column bases and capitals were made of stone, even on wooden shafts, but the existence of wooden capitals is probable. The buildings at Persepolis include three general groupings: military quarters, the treasury, and the reception halls and occasional houses for the King. 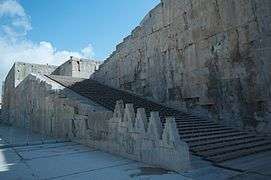 Noted structures include the Great Stairway, the Gate of Nations, the Apadana, the Hall of a Hundred Columns, the Tripylon Hall and the Tachara, the Hadish Palace, the Palace of Artaxerxes III, the Imperial Treasury, the Royal Stables, and the Chariot House. Ruins of a number of colossal buildings exist on the terrace. All are constructed of dark-grey marble. Fifteen of their pillars stand intact. Three more pillars have been re-erected since 1970 AD. Several of the buildings were never finished. F. Stolze has shown that some of the mason's rubbish remains. Behind the compound at Persepolis, there are three sepulchers hewn out of the rock in the hillside. The facades, one of which is incomplete, are richly decorated with reliefs. About 13 km NNE, on the opposite side of the Pulvar River, rises a perpendicular wall of rock, in which four similar tombs are cut at a considerable height from the bottom of the valley. The modern Iranians call this place The Rostam Relief, from the Sassanid reliefs beneath the opening, which they take to be a representation of the mythical hero Rostam. It may be inferred from the sculptures that the occupants of these seven tombs were kings. An inscription on one of the tombs declares it to be that of Darius Hystaspis, concerning whom Ctesias relates that his grave was in the face of a rock, and could only be reached by the use of ropes. Ctesias mentions further, with regard to a number of Persian kings, either that their remains were brought "to the Persians," or that they died there. The Gate of All Nations (Persian: دروازه ملل), referring to subjects of the empire, consisted of a grand hall that was a square of approximately 25 metres (82 ft) in length, with four columns and its entrance on the Western Wall. There were two more doors, one to the south which opened to the Apadana yard and the other opened onto a long road to the east. Pivoting devices found on the inner corners of all the doors indicate that they were two-leafed doors, probably made of wood and covered with sheets of ornate metal. Darius the Great built the greatest palace at Persepolis on the western side. This palace was called the Apadana. The King of Kings used it for official audiences. The work began in 515 BC, and his son, Xerxes I, completed it 30 years later. The palace had a grand hall in the shape of a square, each side 60 metres (200 ft) long with seventy-two columns, thirteen of which still stand on the enormous platform. 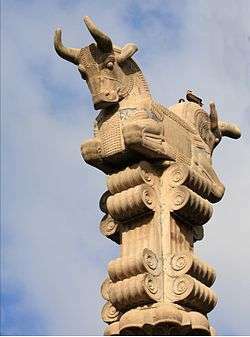 Each column is 19 metres (62 ft) high with a square Taurus (bull) and plinth. The columns carried the weight of the vast and heavy ceiling. The tops of the columns were made from animal sculptures such as two-headed bulls, lions and eagles. The columns were joined to each other with the help of oak and cedar beams, which were brought from Lebanon. The walls were covered with a layer of mud and stucco to a depth of 5 cm, which was used for bonding, and then covered with the greenish stucco which is found throughout the palaces. Next to the Apadana, second largest building of the Terrace and the final edifices, is the Throne Hall or the Imperial Army's Hall of Honor (also called the Hundred-Columns Palace). This 70x70 square meter hall was started by Xerxes I and completed by his son Artaxerxes I by the end of the fifth century BC. Its eight stone doorways are decorated on the south and north with reliefs of throne scenes and on the east and west with scenes depicting the king in combat with monsters. 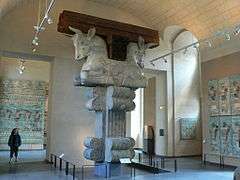 Two colossal stone bulls flank the northern portico. 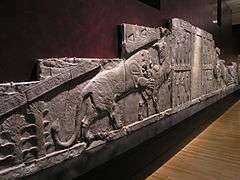 The head of one of the bulls now resides in the Oriental Institute in Chicago, Illinois. It is commonly accepted that Cyrus the Great was buried in Pasargadae, which is mentioned by Ctesias as his own city. If it is true that the body of Cambyses II was brought home "to the Persians," his burying place must be somewhere beside that of his father. Ctesias assumes that it was the custom for a king to prepare his own tomb during his lifetime. Hence, the kings buried at Naghsh-e Rostam are probably Darius I, Xerxes I, Artaxerxes I and Darius II. Xerxes II, who reigned for a very short time, could scarcely have obtained so splendid a monument, and still less could the usurper Sogdianus. The two completed graves behind the compound at Persepolis would then belong to Artaxerxes II and Artaxerxes III. The unfinished tomb, a kilometer away from the city, is perhaps that of Artaxerxes IV, who reigned at the longest two years, or, if not his, then that of Darius III (Codomannus), who is one of those whose bodies are said to have been brought "to the Persians." Since Alexander the Great is said to have buried Darius III in Persepolis, then it is likely the unfinished tomb is his. (Diod. 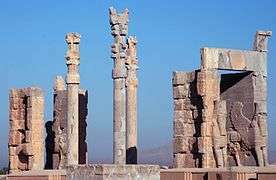 17.70.1-73.2) 17.70 (1) Persepolis was the capital of the Persian kingdom. Alexander described it to the Macedonians as the most hateful of the cities of Asia, and gave it over to his soldiers to plunder, all but the palaces. (2) It was the richest city under the sun, and the private houses had been furnished with every sort of wealth over the years. The Macedonians raced into it, slaughtering all the men whom they met and plundering the residences; many of the houses belonged to the common people and were abundantly supplied with furniture and wearing apparel of every kind…. There is, however, one formidable difficulty. Diodorus says that the rock at the back of the palace containing the royal sepulchers is so steep that the bodies could be raised to their last resting-place only by mechanical appliances. This is not true of the graves behind the compound, to which, as F. Stolze expressly observes, one can easily ride up. 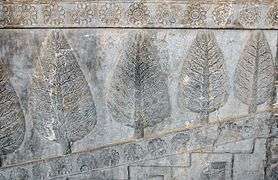 On the other hand, it is strictly true of the graves at the Rostam Relief. 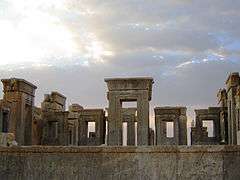 Stolze accordingly started the theory that the royal castle of Persepolis stood close by the Rostam Relief, and has sunk in course of time to shapeless heaps of earth, under which the remains may be concealed. In 1971, Persepolis was the main staging ground for the 2,500 Year Celebration of the Persian Empire under the reign of the Pahlavi Dynasty. It included delegations from foreign nations in an attempt to advance Persian culture and history. Construction of the Sivand Dam, named after the nearby town of Sivand, began on September 19, 2006. 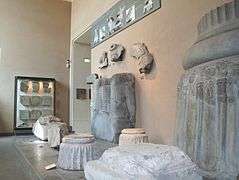 Despite 10 years of planning, Iran's Cultural Heritage Organization was not aware of the broad areas of flooding during much of this time, and there is growing concern about the effects the dam will have on the surrounding areas of Persepolis. Many archaeologists worry that the dam's placement between the ruins of Pasargadae and Persepolis will flood both. Engineers involved with the construction deny this claim, stating that it is impossible, because both sites sit well above the planned waterline. Of the two sites, Pasargadae is considered the more threatened. ↑ Google maps. "Location of Persepolis". Google maps. Retrieved 24 September 2013. 1 2 Michael Woods, Mary B. Woods (2008). Seven Wonders of the Ancient Middle East. Twenty-First Century Books. pp. 26–8. ↑ UNESCO World Heritage Centre (2006). "Pasargadae". Retrieved 26 December 2010. ↑ Holland, Tom (August 2012). In the Shadow of the Sword. Little, Brown. pp. 118–122. ISBN 978-1408700075. ↑ "Persepolis". toiran.com. Retrieved 2015-01-02. 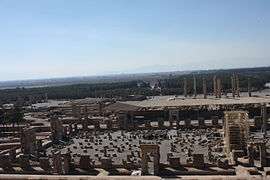 ↑ "Al-Beruni and Persepolis". Acta Iranica. Leiden: Brill. 1: 137–150. 1974. ISBN 978-90-04-03900-1. ↑ Murray, Hugh (1820). Historical account of discoveries and travels in Asia. Edinburgh: A. Constable and Co. p. 15. ↑ C. Wade Meade (1974). Road to Babylon: Development of U.S. Assyriology. Brill Archive. pp. 5–7. ↑ M. H. Aminisam (2007). 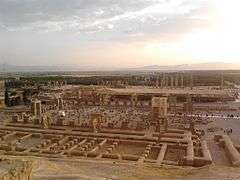 تخت جمشيد (Persepolis). AuthorHouse. pp. 79–81. ↑ Ali Mousavi (2012). Persepolis: Discovery and Afterlife of a World Wonder. Walter de Gruyter. pp. 104–7. ↑ Pierre Briant (2002). From Cyrus to Alexander: A History of the Persian Empire. Eisenbrauns. pp. 256–8. ↑ Penelope Hobhouse (2004). The Gardens of Persia. Kales Press. pp. 177–8. ↑ "Oriental Institute Highlights". Oi.uchicago.edu. 2007-02-19. Retrieved 2012-12-30. ↑ Harper, Prudence O., Barbara A. Porter, Oscar White Muscarella, Holly Pittman, and Ira Spar. "Ancient Near Eastern Art." The Metropolitan Museum of Art Bulletin, v. 41, no. 4 (Spring, 1984). Wikimedia Commons has media related to Persepolis.